A dome volcano is a round shaped mountain made of viscous lava. The lava has a high silica content that prevents the lava from flowing very far from its vent. Most domes are formed by dacite and rhyolite lavas. Lava domes often form in calderas of stratovolcanoes after a major eruption where the summit of the volcano collapses or is blown away during the eruption. A lava dome has been forming in the crater of Mount Saint Helens after the 1980 eruption of the volcano. Other small domes form on the side of large composite volcanoes. A lava dome on the slopes of a composite volcano can become unstable when hot lava erupts causing pyroclastic flows to form on its slopes. These deadly pyroclastic flows sweep down the sides of volcanoes killing everything in their path. The 1902 eruption of Mont Pelee in Martinique was triggered by a lava dome. the pyroclastic flows swept four miles down the side of the volcano killing 30,000 people in the coastal town of St. Pierre. Groups of dome volcanoes sometimes form near subduction zones. Small groups of these domes are located in Oregon and California near the Cascadia Subduction Zone. 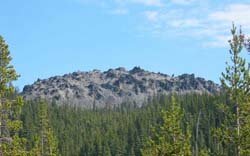 Mono domes and Lassen Peak are examples of domes in California. The picture on this page is one of a group of dacite domes in Oregon.